Didn't see this posted anywhere so I thought I'd start it! Pretty sure all the talks been in the Film Thread. The trailer today looks solid; pretty excited for it. bout time we had one of these! So who are those guys around Kylo at 1:23 ? General consensus says its either the Knights of Ren or some First Order troops. Any predictions on box office sales? I can only imagine Star Wars becoming the number one movie. Avatar currently sits at 2.7 billion for the number one spot from world wide sales. I believe without a shadow of a doubt that it will beat Jurassic World's, Fast7 and Avengers record easily. It easily has the potential to beat Avatar's total gross as well. Avatar is an epic space film, so is Star Wars, but Star Wars is arguably the epic space film. It'll be interesting to see. I'm pretty excited. The Force Awakens will melt the Box Offices. I'll be legit surprised if there's even a mouses fart of a true second place contender (speaking of most recent blockbuster releases, that is). 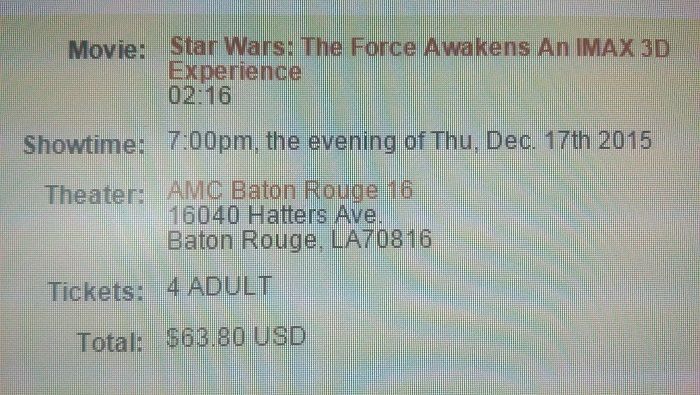 I see lines in my future, and they consist of fat people in Star Wars costumes. What's the official name of this movie? Is it just The Force Awakens or is it Episode VII: The Force Awakens? I really want to know this for some reason. It's Star Wars: The Force Awakens. "Episode VII" has not been used once from Disney besides a placeholder name before the title was revealed. Found this. Seriously think it's the best rendition of the Force Theme yet. Shut your Internet down, boys. Spoilers are leaking. I feel like this thread needs to be a bit more active. Pretty good quality. Can only get the at Walmart though. Just got the 6 Ultra Rare Force Awakens ones that are only offered through Subways at Walmarts. Got all 6 for $20 off ebay so I probably ended up saving money compared to buying 6 kids meals there. Looking into buying Volume 1 and 2 of the Vader comic and Volume 1 of Star Wars that Marvel has been making along with TFA novelization. Anyone been getting anything Star Wars lately? I got oranges and a bag of chips with BB8 on em. I like the color of the couch it mixes really well with the red drapes.